Flip a coin. If heads, the defending Pokémon is an idiot now and FOREVER!!!!!!!!!!!!!!!!!!!!!!!!!!!!!!!!!!!! Flip a coin. 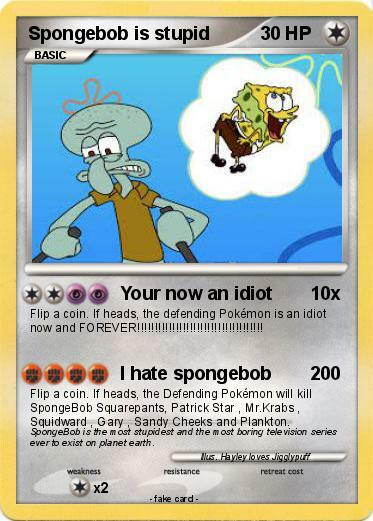 If heads, the Defending Pokémon will kill SpongeBob Squarepants, Patrick Star , Mr.Krabs , Squidward , Gary , Sandy Cheeks and Plankton. Comments : SpongeBob is the most stupidest and the most boring television series ever to exist on planet earth.